"The defensive mindset is 'don't let anything hit the floor,'" junior libero Kate Cobb said. "That's why I love volleyball so much. It just fits my personality." If you’ve attended a Forester volleyball game in the last three seasons, you’ve probably seen a player coming up with balls behind the ten-foot line in impressive fashion and celebrating with her teammates with high energy. Meet junior libero Kate Cobb. In her words, she’s “always the shrimp out of everyone” and standing at 5’5″, has operated in the back row since fifth grade. “I think God made me that way because I definitely fit the personality of playing libero,” Cobb said. Originally, softball was Cobb’s sport of choice, but she ultimately fell in love with the emotion and intensity of volleyball. Her defensive efforts helped the Foresters jump out to a 4-0 start these season. She averaged 14.75 digs per game during the stretch. Cobb also wants to act as a leader on her team this season by how she plays. She said she has found more meaning behind her play since coming to Huntington and making her faith her own. Cobb is using her experience to lead her teammates this season. The team is especially tight-knit this season because one of their teammates is battling a tough diagnosis. Cobb isn’t a stranger to connecting through sports. She said her family of four has bonded through sports since she was young. 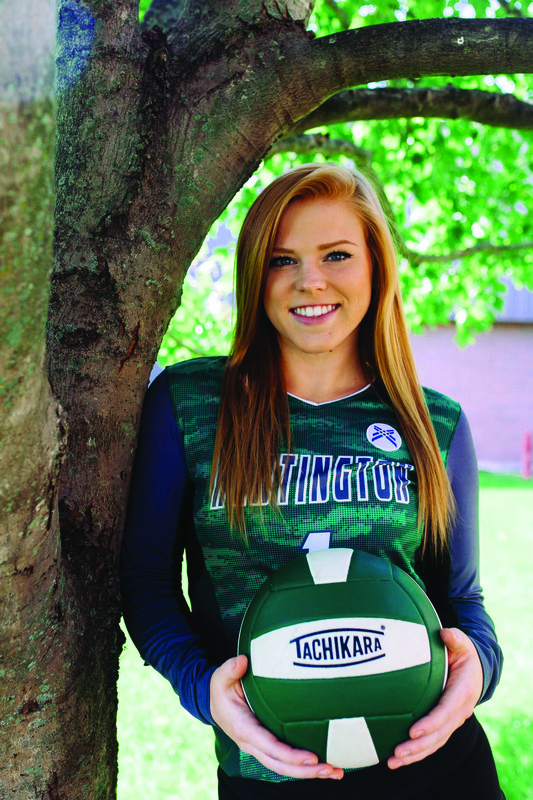 Her younger sister now plays the same three sports Cobb did when she was in high school—volleyball, diving and softball. “Sports have always been a big part of my life,” she said. As a senior in high school, she was named the 2014 Elkhart County Athlete of the Year, an honor her mother also received. The Cobbs were the first mother-daughter duo to earn the award. Cobb has also raked in several honors since arriving at HU. In 2015, she made the all-freshman first team and the all-conference second team last fall. Cobb also made it into the Forester record books with an all-time second-best passing percentage of 96.1% as a freshman. She has her sights set on a different award this season—Crossroads League Libero of the Year. Cobb currently leads the Forester in the digs department with 17.5 per match, good for a spot in the current top-five in the conference. Come see Cobb and her team take on Indiana Wesleyan at Platt Arena on Sept. 24 at 3:00 p.m.